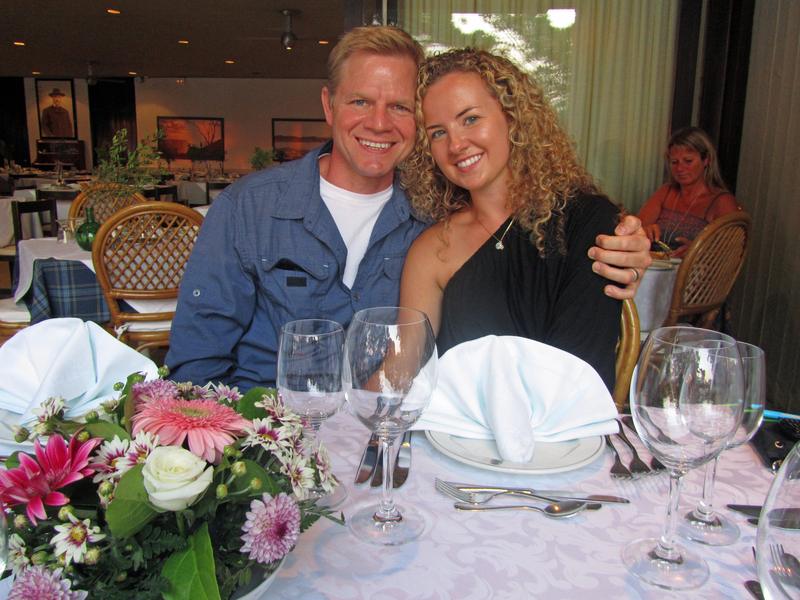 For the Olympic athletes in Sochi, nutrition is a science, and diet is a central focus of the competitors. Diet was just as important to the first Olympians, some 2,700 years ago. And for Ancient Greeks, food was about much more than nutrition. The ancient Greeks did not have many foods that today’s Greeks take for granted: tomatoes, peppers, eggplant, corn, potatoes, chocolate, and many types of fruit and spices. These foods would remain exclusive to the New World or to Asia for a long time into the future. Ancient Olympians ate simple foods. For meat, they had mutton, beef, goat, and pork. Greeks who lived by the sea ate fish, although for many centuries fish was considered a food of the poor. Access to fresh fruit was limited; accordingly, Greeks ate a lot of dried fruit. Dried figs were a staple of the Greek diet. They ate a flatbread made of wheat, barley, or rye. Honey was their sweetener. They used herbs intensively in their cooking, which was done in earthen ovens or roasting fires. And Greeks loved their wine and olive oil. Athletes actually bathed themselves in olive oil before competitions. One of the original Olympic champions, Milo of Croton, was the greatest wrestler of Ancient Greece. He won a gold medal at six consecutive Olympics games, and a silver in his seventh competition. To finally defeat him, a new school of wrestling, called standing or long-armed wrestling, was invented. The long-armed wrestling kept Milo on his feet and at arm’s length until the old man could be worn down and finally pinned after nearly thirty years. At one of the Olympic Games, Milo picked up a four-year-old bull and carried it around the stadium on his shoulders in front of 50,000 screaming spectators. Then he butchered it, cooked it, and ate the entire thing in front of his fans. I would hate to have to wrestle that guy. Milo ate up to 20 pounds of meat per day, but Milo was the exception. 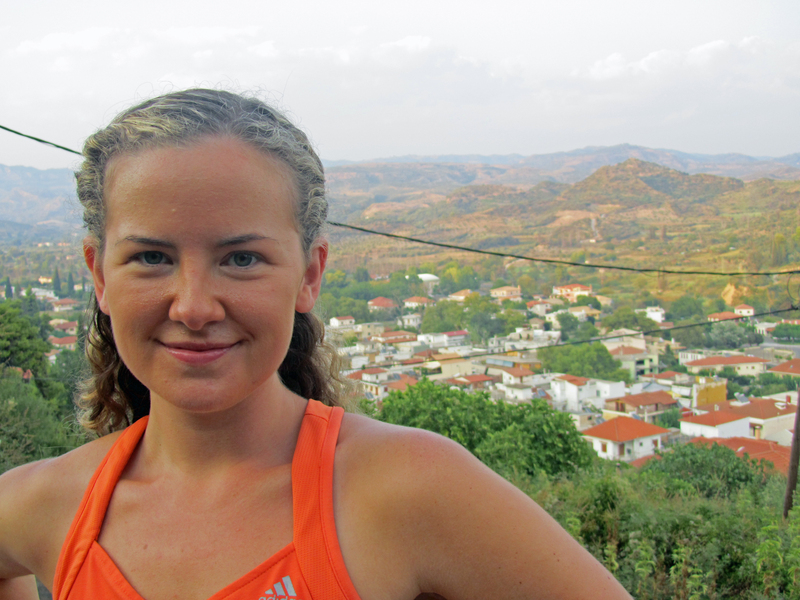 Greek athletes typically sought balance in their diet, and they were very careful about what they ate. The food, along with the training regimen of the competitors, continually evolved over time. Occasionally, a great champion would emerge who ate a peculiar diet, and this diet would launch a food trend across Greece that lasted sometimes for decades. Once, when a great champion emerged who ate a meat-only diet for a year prior to the games, a meat-only diet craze spread across Greece. This fad lasted for a long time. If a champion announced that he never ate bread prior to a competition, Greeks across the country would shun bread until a new athlete emerged who swore by bread. In some years, eating honey became a fad, and honey was sought in great quantities to give energy to athletes. In other years, honey was avoided because it was believed that sugar slowed down an athlete. These food fads differed from modern fad diets, because there was not a lot of marketing and commercialization involved, but rather a quest for perfection and purity in the diet. While the great philosophers were thought leaders in Greece, the Olympic athletes led the food trends. Thirty days before each Olympic competition, a Sacred Truce was declared, and runners were sent all over Greece with a special disk which declared free and safe passage to the games, no matter what kind of wars the city-states might be waging. The Sacred Truce was held so dear that it was never violated for 800 years, which says a lot about how important the Olympic Games were in Greece. As the games increased in popularity, every element of the competition was honed to the highest level of perfection, including the food. Winning a gold medal was the highest honor in the Greek world, and the champions of Ancient Greece were bigger than the rock stars of today. A great champion might spend the rest of his life being entertained by the wealthiest Greeks, and having honors heaped upon him. He would likely be hired to train young Olympians in the art of competition, and he would make a lot of money at this. Part of this training was diet. The diet of ancient athletes was simple, but the purity of their food was of paramount importance. The ideal of Greek philosophy was perfection in forms: perfect laws; perfect statues; perfect athletes. To achieve this ideal for the whole, the parts must first be perfected. Sculptors, for this reason, went to great lengths to obtain the finest marble for their statues of the gods. Athletes likewise demanded the purest foods in their diet, to build their muscles, to chisel their bodies. The farmers considered themselves artisans, no less than sculptors. Their tools were sun, rain, seed, and soil. Farmers, like the athletes they partnered with, strived for greatness. Farmers competed to grow the best and purest foods for their athletes. Animal husbandry, types of fertilizer, management of the soil, plant selection, and other techniques were employed to continually improve the quality of the food offered to athletes. Not only that, farmers helped with the curing, drying, and packaging of food for the long transport to the Games. 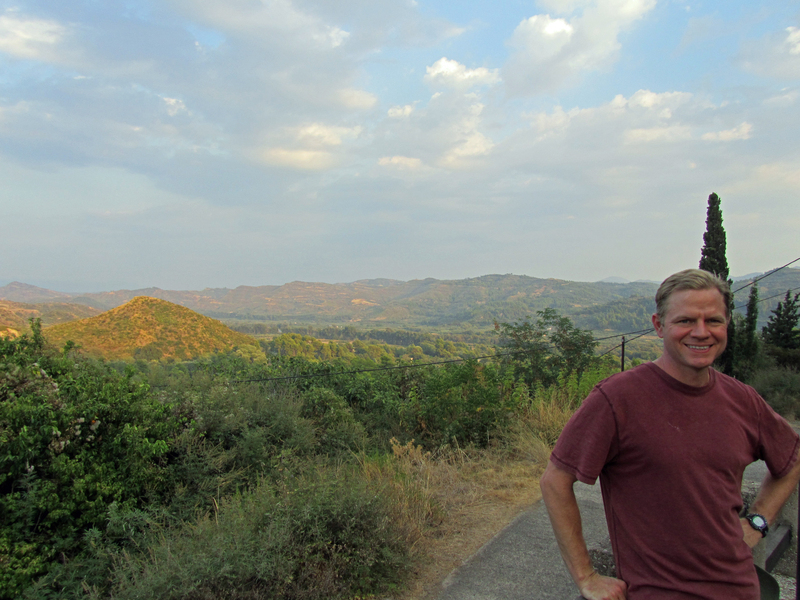 Ancient Olympia was, and still is, surrounded by barren rocky hills. 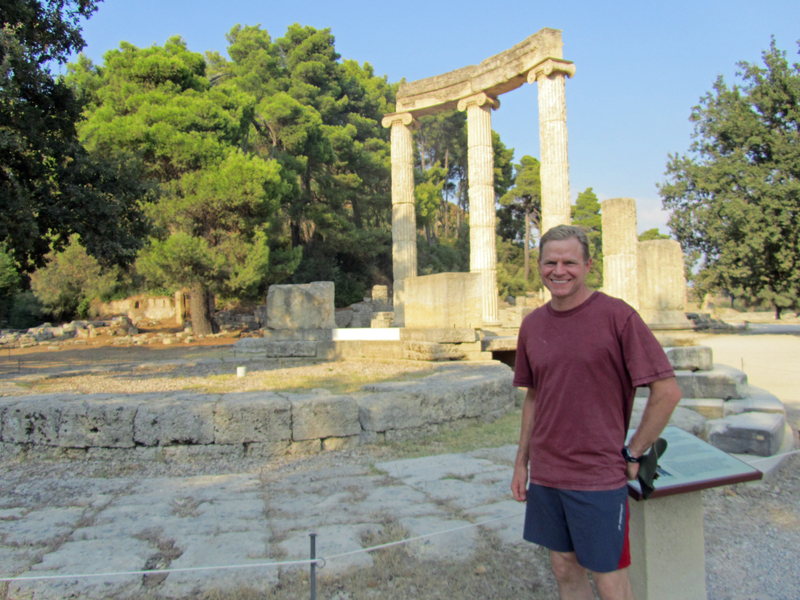 The small village in Olympia could not begin to supply the 50,000 Greeks who descended on the arena for the competition. There were no crops around Olympia, and there was very little grass for animals in the hills. 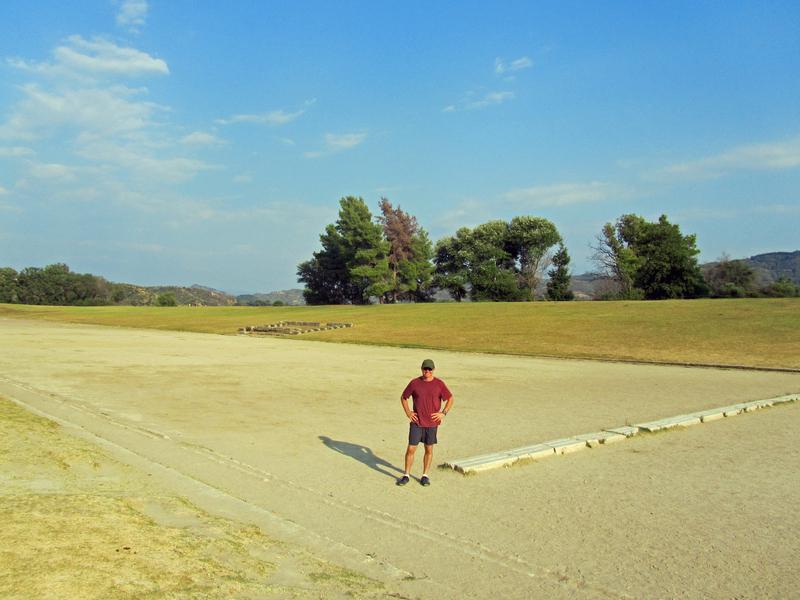 The teams had to travel great distances from their homeland to the Games in Ancient Olympia. Some teams had to travel hundreds of miles on foot, and some came by sea in tiny boats. They had to pack and transport all of their baggage and food. They had to bring enough food to last the long journey, a month on location, the Games, the feast that followed the games, and the trip home. All of the livestock had to be driven to the Games–the cows, sheep, goats–and their forage had to be carried on carts. There was no forage around Olympia, and the animals had to be fed, and it was critically important that athletes have access to fresh meat, and that fresh meat be available for the sacrifices to the gods. The dried fruit for the athletes had to be prepared and packaged well in advance. All the grains to make bread, the honey, the herbs, and all other foodstuffs had to be packed. Of critical importance, the wine and olive oil had to be prepared and bottled with enough time to age, and then packed carefully into carts to be shipped to the games. Growing, curing and drying, packaging, and shipping this food was a monumental feat of logistics. Some of the teams came from wealthy city-states, like Athens, who could afford the very best in transportation and logistical support. Some of the teams came from poor areas, and the athletes had to travel to the Games on foot, carrying all of their baggage and food on their backs. When one of these athletes emerged victorious in the Games, he was duly honored for his greatness in rising above difficult circumstances. Farmers partnered closely with athletes and coaches in this process, even though farmers typically were not able to attend the Games. Often, as soon as the teams returned from an Olympic competition, they would begin planning for the next games, four years away. When the teams got to Olympia, they had to set up rough camps in the hills around the stadium. Tens of thousands of people were closely packed into this space, so there were many opportunities for mischief. Teams had to set up guards on their food and baggage, to make sure they were not robbed of their sustenance. Sometimes there was treachery as one team attempted to steal from another, to make up for a shortfall in food planning, and this was considered cheating. Cheating at the Olympic Games was one of the worst offenses of Ancient Greece. The games themselves were a religious festival meant to honor Zeus, and to dishonor the greatest of gods was a grave offense. 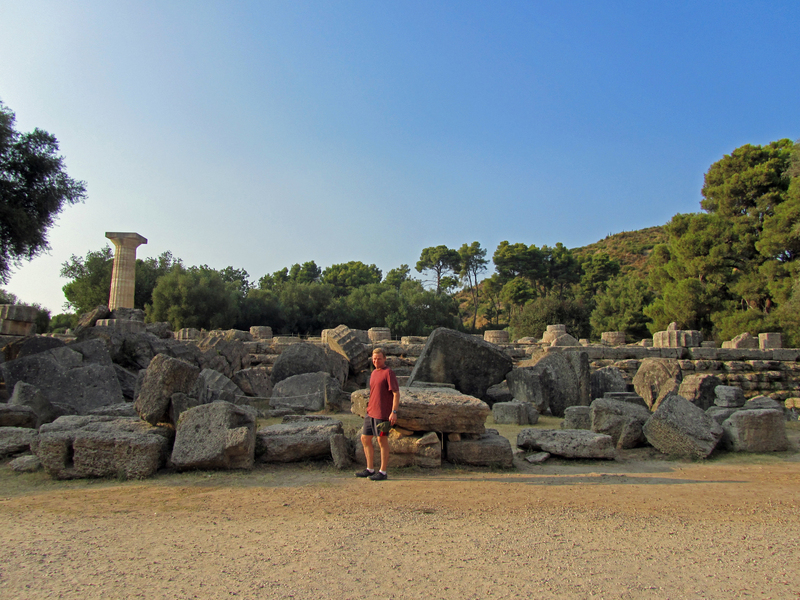 Cheaters at the games were ordered to build entire temples to Zeus, a process that would take all the money and labor of an athlete for the rest of his life. Some cheaters who did not pay this penance were executed. Cheaters also faced the greatest shame possible in Ancient Greece. 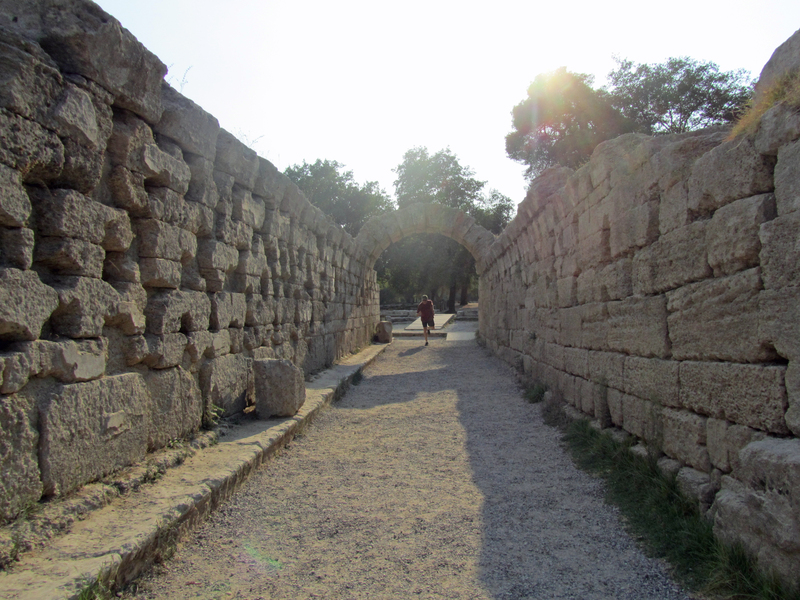 If an athlete was caught cheating, the athlete’s name was chiseled into a wall of disgrace close to the main temple to Zeus, near the entrance to the stadium. To have your name hammered into that wall was a penalty worse than death. Kayla and I walked down this wall where these names were chiseled, still showing their dishonor, more than 2,500 years later. 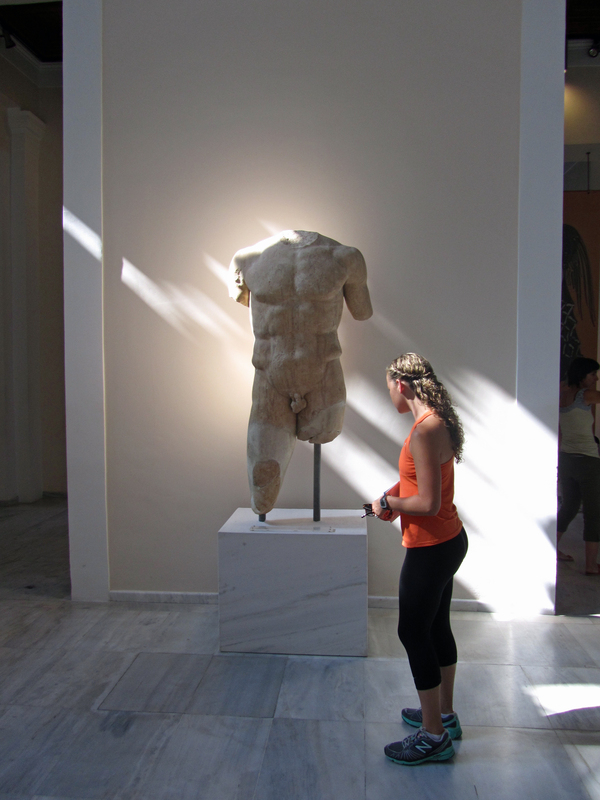 Kayla and a Statue of Zeus. She insists she is reading the caption! Food was not only art to Greeks; food was an offering to the gods. When a bull was butchered, a priest first slapped the sides of the bull with barley stalks and the seeds were sprayed on the ground along with the cleansing blood. Next, the fat of the bull was wrapped around the thigh bones and placed on a purifying fire as a sacrifice to Zeus, and the prayers of the champions mixed with this smoke rising to the gods. Only the purest food was fit for such a sacrifice. I wonder what those farmers of old would think about our modern methods of farming, with the hormones, steroids, and antibiotics in meat, and the chemicals in conventional vegetables. Interestingly enough, the greatest Olympic champions of today seek out only the purest of foods—a pursuit very similar to the competitors of old. 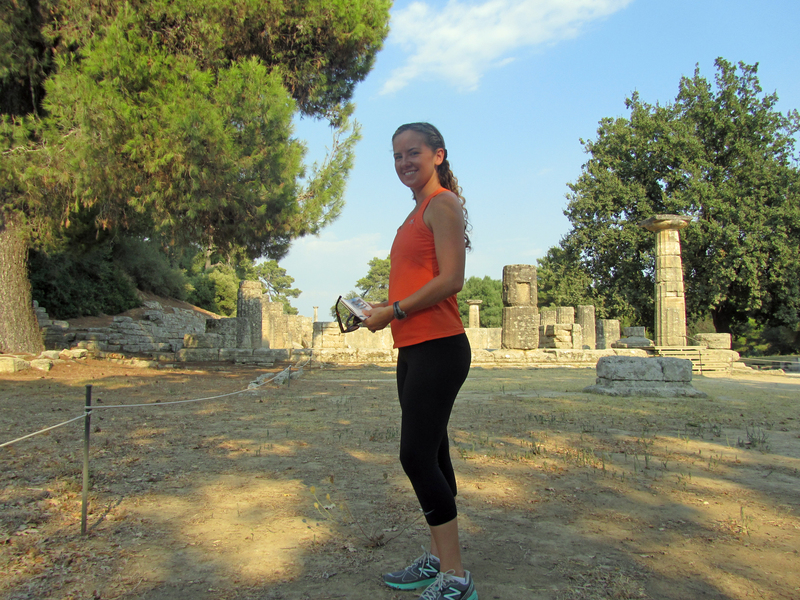 At the ruins in Ancient Olympia, the site of the original games, Kayla and I walked down a long wall of beautiful stone panels telling about the crops and the livestock of the city-states of Greece, and how this food nourished the champions of antiquity. The various city-states were represented with their grains, their olives, their vegetables, their cattle, their fish, their wines. Those farmers are lost to history, but you can still read the names of their great champions chiseled into the stone. Those names represent the highest achievement of the Ancient Greece: perfect art, perfect food, perfection in physical forms. These are the ideals that our athletes of today seek in Sochi.